Custom barcode labeling software easily generate barcode labels for healthcare industry in different formats including Tag, Coupons, Rolls, Stickers to fulfill healthcare industry barcode labeling needs. 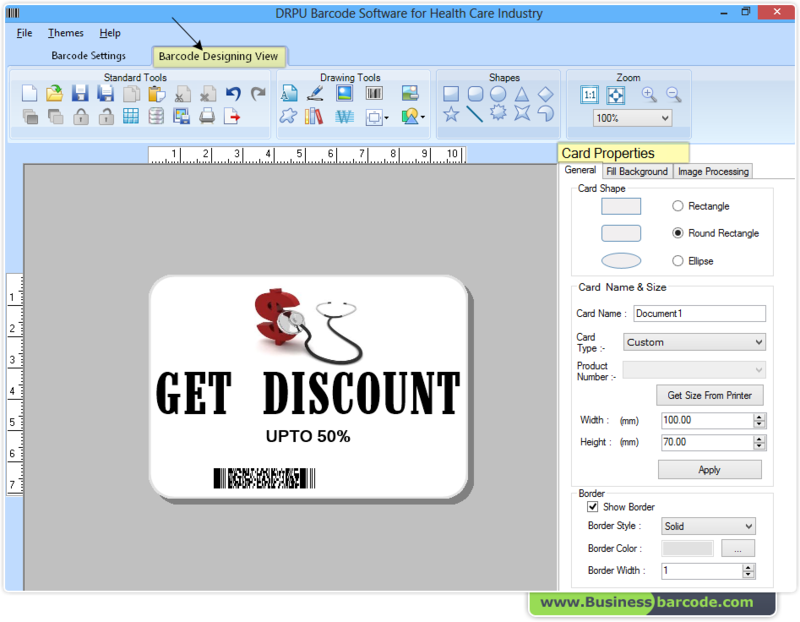 Barcode creator software create and print customized barcode label for barcoding healthcare products (blood bottles, medicines, medical tools etc) in 2D and linear barcode font style. Barcodes labeling tool provides pharmaceutical barcode designing view with high resolution image designing objects such as Texts, Lines, Pictures and other similar objects etc. Health care barcode labeling tool creates customized health care industry barcode labels with available barcode image designing view. Barcoding Software provides pharmaceutical barcode labels designing view with option to design barcode labels using Texts, Lines, Pictures etc. Generate multiple bar code lists useful in labeling healthcare products, healthcare equipments, health care toolkit etc. Healthcare industry label maker tool design multiple barcode labels using Random, Sequential and Constant value bar codes series producing techniques. You can easily copy Pharmacy Barcode Label and paste at specified application including MS-Word, MS-Paint, MS-Excel etc. You can easily save medical barcode images in JPEG, TIFF, Bitmap, PNG and GIF file formats on PC using bar code software.